Submergence negatively affects the rice production in flood prone and rain-fed lowland areas of Asia. Though rice is semi-aquatic plant, prolonged submerged conditions are deleterious to get high yield. Submergence disturbs the morpho-physiological growth and development of rice plant. 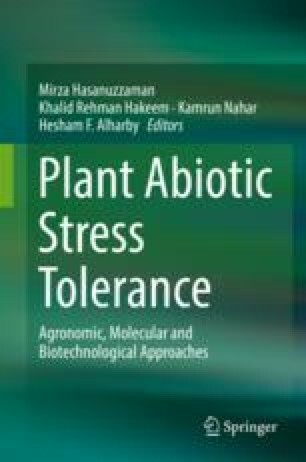 This chapter discussed the harmful effects of submergence on growth, metabolic responses, photosynthesis, gaseous exchange, oxidative metabolism, and carbohydrate consumption of rice. For survival, rice plant adopts tolerant mechanisms such as quiescence and escape strategies, formation of barrier to radial oxygen loss (ROL), gas films and aerenchyma formation. In quiescence strategy, several transcription factors are involved in negative regulation of genes to reduce the elongation. On the other hand, in escape strategy ethylene mediated factors are involved in elongation of internodal distance. We also proposed the physiological (e.g., seed priming) and molecular approaches for enhancing the rice tolerance to flood prone and rain-fed lowland conditions.